This 360 degree panorama shows one of ESO’s Very Large Telescope (VLT) Unit Telescopes (UT4) whilst it was recently briefly held prisoner by ESO’s engineers. 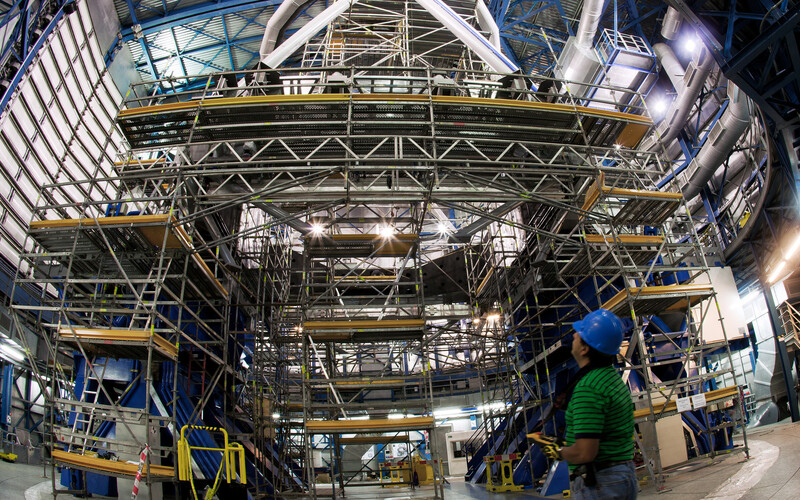 It was surrounded by a temporary cage of scaffolding as part of the preparations for the new Adaptive Optics Facility (AOF). This project will convert UT4 into a fully adaptive telescope. The AOF will correct for the blurring effects of the Earth’s atmosphere and will allow much sharper images to be achieved with the HAWK-I and MUSE instruments. Many new components are being added to UT4 as part of the AOF. Among these is the deformable secondary mirror (DSM): a thin-shell mirror, 1.1 metres in diameter, but just 2 millimetres thick. This mirror is thin enough to be easily deformed by more than a thousand actuators, up to a thousand times per second in order to counteract the atmosphere’s distortions. The DSM is the largest adaptive mirror manufactured to date (ann12015). 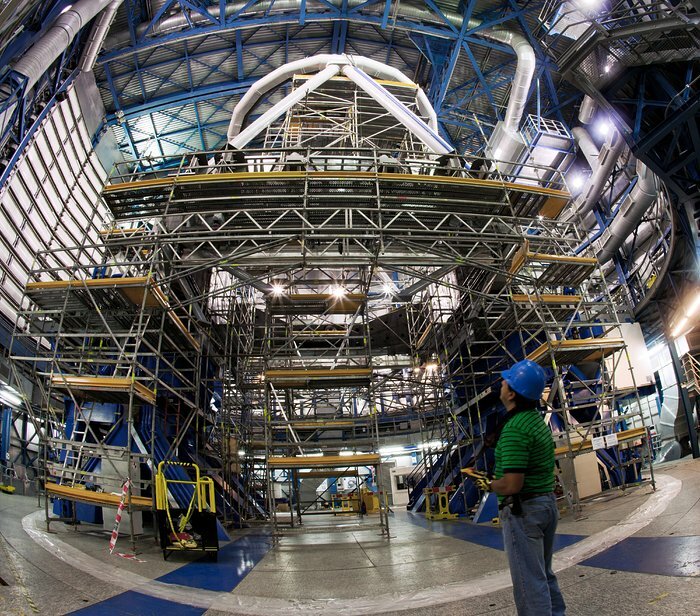 Another vital element is the four Laser Guide Star Facility (4LGSF) — four special telescopes that fire laser beams high into the atmosphere to create artificial stars  (ann12012). Finally, the GRAAL and GALACSI adaptive optics modules will be responsible for analysing the light coming back from the laser guide stars. 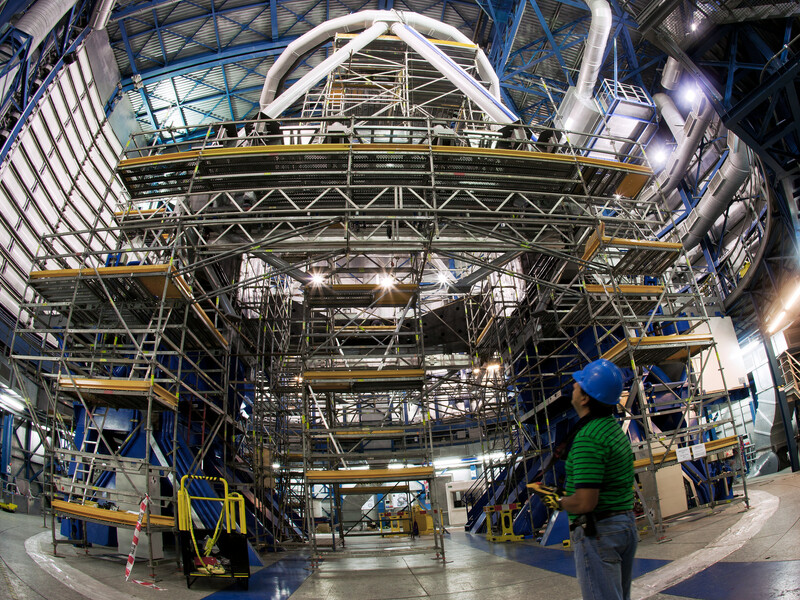 This picture shows an ESO engineer supervising the work performed on UT4. 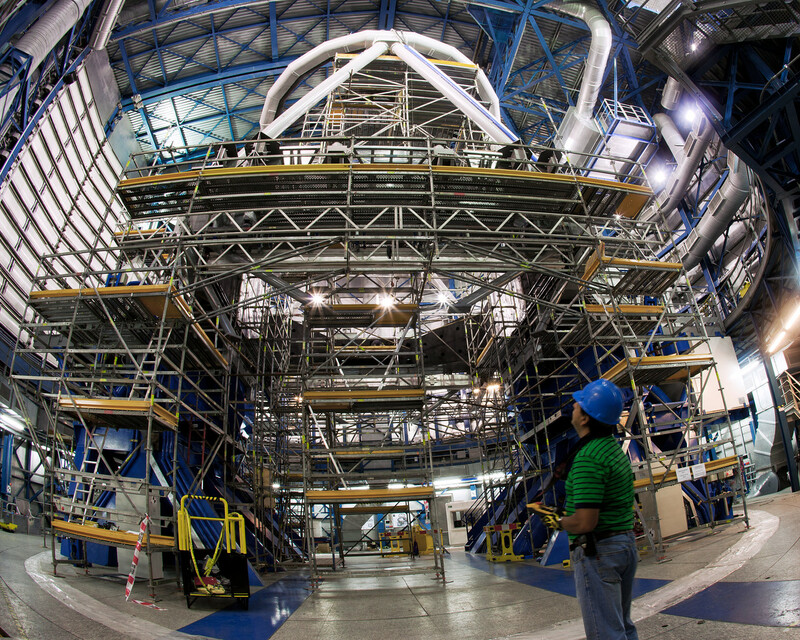 To allow full access to the telescope, the cell of the primary mirror has been temporarily removed. Cables and pipes have also been removed and new ones have been installed. Mounting brackets have been added in preparation for the installation of the 4LGSF electronic cabinets and launch telescopes. The laser beams excite a layer of sodium atoms at an altitude of 90 kilometres in the atmosphere, making them glow as artificial stars.